Guido Fawkes was just thirty six years old when he stood in the Old Palace Yard of Westminster. His punishment for attempting to blow up the Houses of Parliament, on November 5th 1605, was execution! Fawkes was one of many people who thought the Government was treating Roman Catholics unfairly. They were disappointed with King James and his leaders, so a band of men decided to blow the lot of them up! 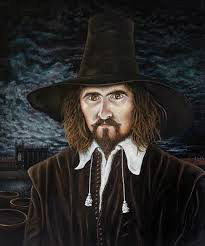 This tall and powerfully built man with thick auburn hair, a flowing moustache and a bushy beard, known to us all as Guy Fawkes, had been caught red handed and in the possession of The 36 barrels of gunpowder in a cellar below the Houses of Parliament. There was more than enough powder to raise Parliament and the surrounding area to the ground. Whilst waiting to be hung, drawn and quartered, Guido Fawkes threw himself off the scaffolding and broke his neck, thus avoiding the agony of mutilation. His only regret, he said beforehand, was that the attempt to blow the place up, failed!